Think Walktober! Plan Your Walktober Now! The Last Green Valley, Inc. (TLGV) is gearing up for its 27th fun-filled year of Walktober! The deadline to submit your Walktober activity for inclusion in the program this fall is June 30, 2017. Easy-to-use online forms are available at www.thelastgreenvalley.org/explore-the-last-green-valley/walktober. Last year, volunteer leaders offered close to 300 guided walks, strolls, hikes, bike rides, paddles, tastes, sips, and events, and more than 60,000 people participated. Walktober boosts economic activity in our 35 towns not only during the fall, but all year long as visitors return to their old and new-found favorite spots in the National Heritage Corridor. This is happening right now during TLGV’s new Spring Outdoors program! Inspire others by hosting or leading a Walktober activity. TLGV members, including nonprofit and business partners, are welcome to showcase their specialties. Need an idea? Ranger Marcy is happy to help! Call 860-774-3300 or email marcy@tlgv.org and learn how you can connect residents and visitors alike to all The Last Green Valley has to offer. Southbridge focused on its assets last year and presented over 30 Walktober choices as the town and nonprofits worked together to coordinate activities that attracted visitors. Norwich, Putnam and Windham also worked on this model and offered many coordinated choices. Is your town ready to improve its Walktober exposure this year? Take the lead to ensure that your town, business or nonprofit makes the most out of Walktober, too! Can’t wait for Walktober to get out and explore our region? Participate now in more than 150 Spring Outdoors choices, with more being added all the time. 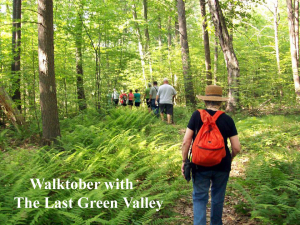 Learn more about Walktober, Spring Outdoors and everything else happening in The Last Green Valley online at www.thelastgreenvalley.org and on Facebook and Instagram. The Last Green Valley is a National Heritage Corridor – the last stretch of dark night sky in the coastal sprawl between Boston and Washington, D.C. The Last Green Valley, Inc. works for you in the National Heritage Corridor. We help you to care for it, enjoy it and pass it on. ← Guided Hikes, Paddles & Pedals Beckon You to Spring Outdoors!